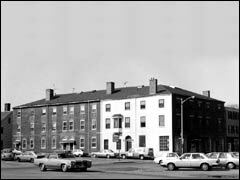 This section of the Website presents images and information on the commercial buildings in Salem listed below. In some cases the buildings are related to Nathaniel Hawthorne; in other cases buildings are included to give a sense of Hawthorne's world and also of the Salem a visitor would encounter today. All of these buildings also appear on the 1840 and/or modern map of Salem.